A series of email dumps from the Commerce Department—mandated by discovery rules in ongoing litigation against the Trump administration—has undermined the administration’s justification for adding a citizenship question to the 2020 census. Commerce secretary Wilbur Ross announced in March that the U.S. Census Bureau would ask every person in the United States about their citizenship status during the 2020 decennial survey. The decision ignored the advice of six former Census directors, multiple Census advisory committees, and even the Bureau’s own chief scientist, who agreed the question would jeopardize the accuracy of the 2020 enumeration (chiefly by discouraging immigrant communities from participating). In a March 2018 memo explaining the decision, Secretary Ross said the Bureau was adding the query in response to a December 2017 request from the Department of Justice (DOJ)—who needed the data, DOJ said, to better enforce protections for minority voters under the Voting Rights Act (VRA). But emails released in the past two weeks show that administration officials and allies—including Secretary Ross, Steve Bannon, and anti-immigrant Kansas secretary of state Kris Kobach—began discussing the need for a citizenship question within months of Donald Trump’s inauguration, well before DOJ made its request. “These emails suggest that the Commerce Department’s rationale was, to use a technical term, horseshit,” said Justin Levitt, a law professor at Loyola University who served as a deputy assistant attorney general overseeing the DOJ’s civil rights division from 2015 to 2017. Levitt, who helped enforce the Voting Rights Act during his tenure at DOJ, testified to Congress in May 2018 that the citizenship question is “unnecessary” to enforce the VRA. Reliable data on citizenship, Levitt and other voting experts have said, is already available to the DOJ from the sample-based American Communities Survey (ACS). Because inquiring about citizenship status will likely depress response rates among immigrants, the data derived from the survey will be worse than what is now available from the ACS. While there are “known statistical means of compensating for low response rates in a survey like the ACS,” Levitt said, sampling to correct projected undercounts in the Census is not permissible. The administration’s explanation had always been suspicious. The Jeff Sessions DOJ has shown no particular eagerness to enforce voter protections. Much more likely, advocates say, is that the administration is hoping to scare immigrants and minorities away from filling out the Census, thereby reducing the flow of federal dollars to and undermining political representation in urban areas with high immigrant populations. The emails disclosed in the past few weeks paint a different picture of the decision-making process behind the citizenship question than has been represented by administration officials. Emails released in June revealed that Kobach, who briefly helmed a controversial “voter fraud” commission, reached out to Secretary Ross in July 2017, urging him to add a citizenship question. 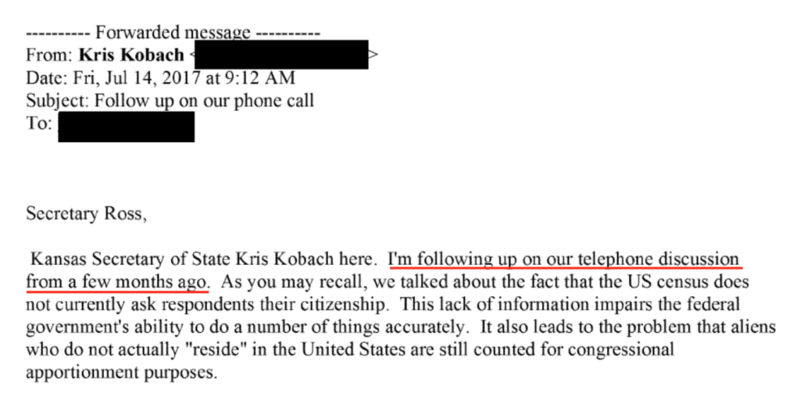 In an email, Kobach wrote that undocumented immigrants should not be counted in the Census because they “do not actually ‘reside’ in the United States.” (They do.) Kobach also references a phone call he had with Secretary Ross several months earlier “at the direction of Steve Bannon”—who was then Trump’s chief strategist and whose position on immigration (legal and illegal) is well documented. 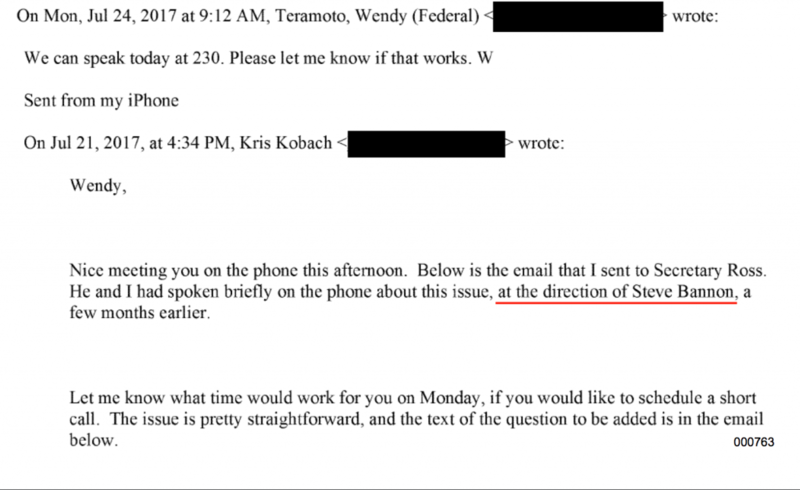 Emails between Kansas Secretary of State Kris Kobach and Commerce Department officials. Source: Court documents obtained by author. Note that at the time of this email, President Trump had been in office for less than three months. If Ross’s request was “months old” in May 2017, it means he began the process of adding a citizenship question to the Census almost immediately upon assuming his post. “That sure doesn’t sound like the request started with DOJ,” Levitt said. Emails between Commerce Secretary Wilbur Ross and his aide, Earl Comstock. Source: Court documents obtained by author. This chain of events contradicts Secretary Ross’s repeated testimony to Congress that the request for a citizenship question was “initiated” by the Justice Department—and not the other way around. Representative Elijah E. Cummings (D-MD), the ranking member of the House Committee on Oversight and Government reform, documented over a half a dozen instances in which Secretary Ross implied that DOJ made the request and Commerce was merely responding to it. Another exchange during congressional testimony caught my eye. At a March 20, 2018 appropriations committee hearing, U.S. Representative José Serrano of New York (D) asked Secretary Ross, “Has the president or anyone else in the White House directed you to add this or a similar question to the 2020 census?” Ross replied, “We are responding solely to the department of justice’s request” (emphasis added). “Solely” is a strong word. Now, we don’t know whether Ross’s interest in adding a citizenship question was spurred by someone else in the Trump administration—though we do know it well preceded the DOJ’s request. And we also know that Ross discussed the citizenship question with Kris Kobach months before July 2017, and that Kobach was directed to call Secretary Ross by Steve Bannon, then a top White House advisor. What precisely these revelations mean for the six ongoing lawsuits against the Trump administration regarding the citizenship question remains to be seen—but they are likely to prove significant for those cases. “The Court is compelled to conclude that the citizenship question is a permissible – but by no means mandated – exercise of the broad power granted to Congress and, in turn, the Secretary pursuant to the Enumeration Clause of the Constitution,” Furman wrote. The emails bolster the plaintiffs’ claim that the administration violated the Administrative Procedures Act (APA), which prohibits federal agencies from taking “arbitrary” or “capricious” action. If they can prove that the Commerce Department sharply deviated from its normal practice, neglecting to undertake a robust and careful decision-making process, the Court could force the government to set aside the citizenship question. Sam Adler-Bell is a senior policy associate at The Century Foundation.